Find Groomers and Hydrobathing services in your area below. Coloured Dogs Have All The Fun! Dogs can be groomed to create a fun experience for both the dog and the owner. 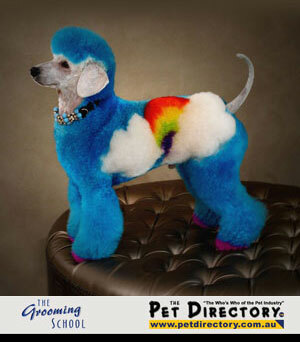 This cute poodle has been clipped and coloured using dog dyes which are harmless and semi-permanent. “Chisholm” is wearing dog jewellery and his clip and colour dye are in the theme of blue sky, white clouds, and a multi coloured rainbow. Dogs groomed in this exciting way receive heaps of attention from everyone as they become the centre of attention. This type of creative grooming is nice for the dogs and nice for the owners. It is also a wonderful challenge for a groomer. You can find a local groomer in your area in The Pet Directory list above. On the left is an image of “Chizzie” supplied by Christine Speerin ICMG of The Grooming School Pty Ltd in Australia. Christine teaches students of all levels to groom dogs as well as show the more advanced methods such as colouring and also judges grooming contests overseas. Find a local Dog Groomer or Dog Hydrobath Service to do dog grooming or dog clipping. Visit the Everything You Need to Know About Dog Grooming page! Read Dog Grooming Articles, See photos of amazing coloured groomed dogs at Australian dog grooming displays and dog grooming competitions. Links to top new dog grooming products and services. Find out about buying a Dog Grooming Franchise or Dog Grooming Business for yourself. The fastest growing online grooming equipment & vet supplies store in Australia. Invitation to groomers to supply dog grooming articles for publication. For your article to be considered for our grooming section you must be a member of The Pet Directory website. We are looking for short articles on a range of topics relating to dog grooming. Please send your ideas to The Pet Directory Editor using our contact us page below. NOOTIE - Shampoo & Daily Spritz in one bottle! 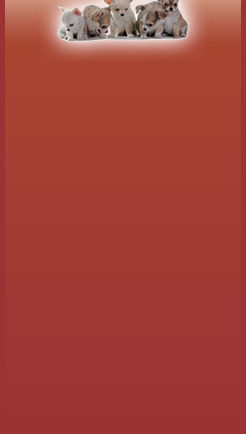 QUICK, EASY & FUN! Wholesale Enquiry Welcome! The Pet Directory proudly supports the Grooming Industry around Australia. The link below will show you some photos of one event that we sponsored. *There are currently 118 people online.